Experimenting with active learning strategies helped Professor Rifka Cook revise her Spanish 121 Special Topics: Gastronomia e Identidad Hispana course this spring quarter. Cook redesigned the course with the help of Jonathan Diehl, a blended learning specialist in Faculty Support Services. The reworking of her course was her project as part of the 2016-2017 Educational Technology Teaching Fellows program. 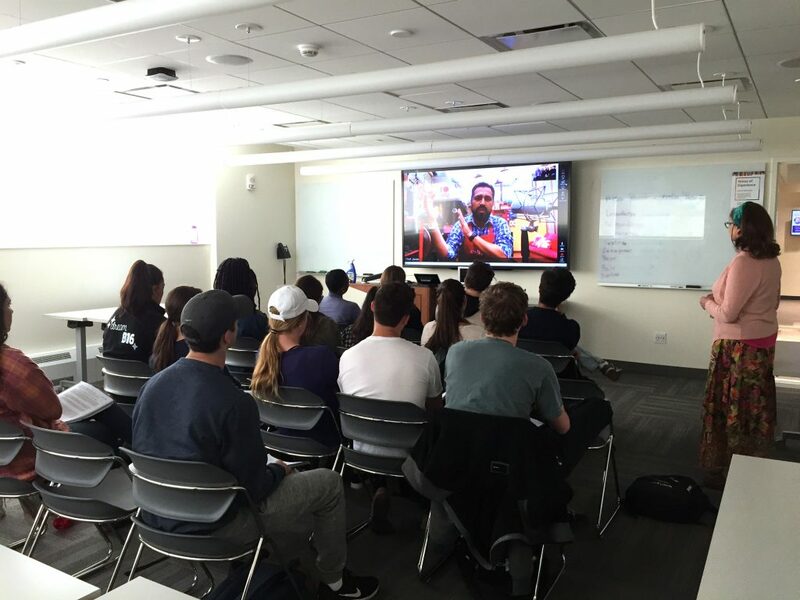 Cook invited chefs from Venezuela, Mexico, and Guatemala to make virtual appearances in her course using the BlueJeans videoconferencing tool in Canvas. Students prepared for each chef’s visit by writing up meaningful interview questions to ask the chef. The day before the interview, students were paired up to practice asking each other the questions in Spanish. Cook also reviewed their Spanish skills prior to each event. After each guest speaker’s visit, the students reflected on what they’d learned and how they could have improved on their interviewing skills in the target language. “Students explored the intimate connection between food and identity through each chef’s visit and through our discussions of the class readings,” Cook said. Cook also added cooking events to her course. Using Shepard Hall’s new Global Kitchen, students actually made many of the dishes that they learned about in the course, practicing their Spanish the entire time. Students learned how a dish cooked in Spain had evolved over time as it was carried to different countries and cultures in Central and South America. Some students acted as hosts to visitors at these cooking events, explaining the cultural significance of the food, while the rest of the students prepared the delicious dishes. Diehl, who helped Cook redesign her course, noted that students appreciated the hands-on nature of many of the activities in the course. “Since students were able to speak with chefs from several Latin American countries, they felt more motivated to learn the material. Students mentioned that interacting with the chefs virtually and experiencing the cultures’ foods during the cooking sessions made the learning experience unique. Overall, the students were excited to come to class and learn,” Diehl said. Applying for the Educational Technology Teaching Fellows program for 2017-2018. Applications will be available in late July; in the meantime, you may fill out the ETTF Interest Form. Learning how to host a guest speaker in your course. Exploring the new active learning spaces on Northwestern’s campus.